View More In Expedition Tents. 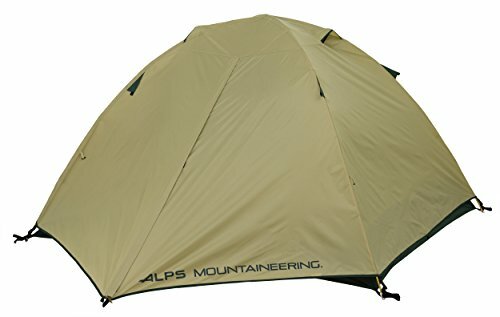 The ALPS Mountaineering Taurus 2 Outfitter Tent features oversized #10 door zippers and a heavy duty nylon oxford floor. The zippers will give you a lifetime of smooth operation and the oxford floor is about twice the weight of normal nylon floor material, greatly increasing its durability. The poles are made of aircraft alloy 7000 series aluminum that is strong and lightweight. Assembly is really easy with the tent clips that just snap in place over the poles. The polyester fly and oxford floor are urethane coated, with factory sealed seams for maximum weatherproofness. The two doors make getting in and out of the tent much easier. You also get two vestibules (one over each door) that you can use for extra gear storage. The vestibules also serve as automatic guy-out points when the weather gets a little nasty. The fly buckles to the tent, offering a much more secure attachment when compared to elastic cord. Mesh roof vents increase ventilation and improve star gazing. Included: Rain fly, 7000 Series Aluminum Poles, Pole Bag, Stake Bag, 7001 Aluminum Stakes, Guy Rope, Repair Swatches, Gear Loft, Mesh Storage Pockets, and Tent Bag. TAURUS OUTFITTER 2 DIMENSIONS: Base Size: 5’ x 7’ 6”, Center Height: 3’ 10”, Vestibule Depth: 32”, Tent Area: 37 square feet, Vestibule Area: 20 square feet, Total Weight: 8 pounds, 7 ounces, Packed Size: 7” x 23”; Pole Diameter: 8.5 mm. Base Size: 5' x 7'6, Center Height: 46", Total Weight: 7 lbs. 6 oz., Minimum Weight: 6 lbs. 10 oz.